The Hitachi SimpleDRIVE Mini external hard drive doesn't have any unique features or outstanding performance, but its bundled backup suite and low cost per formatted gigabyte make it a worthwhile option. The Hitachi SimpleDRIVE Mini is a no-frills external hard drive that doesn't provide stellar file transfer performance, but it offers good value. The Hitachi SimpleDRIVE Mini's design isn't as minimalist as the diminutive LaCie Rikiki drive. Available in red, blue and carbon fibre grey, this external hard drive is reasonably small and lightweight. It has a plastic enclosure and a rubber lining on each side. The drive is silent during operation, and it has two white lights to indicate operation on its underside . Hitachi provides a solitary mini-USB 2.0 connection on the SimpleDRIVE Mini, and bundles an annoyingly short cable that makes it difficult to connect to the back of a desktop PC. The cable has two USB connections which can be used if one port doesn't provide enough power to the hard drive. Oddly, the external hard drive also has a DC connection — presumably to provide even more power — but since an adapter isn't provided and the USB cable has two connections anyway, this port is largely useless. One of the best things about the SimpleDRIVE Mini is its cost; at a current RRP of $109 this external hard drive has a cost per formatted gigabyte of 34.1c. By contrast, LaCie's fashionable Starck Mobile Hard Drive costs 43.4c per GB, though its Rikiki external hard drive costs just 31.8c per GB. The Hitachi SimpleDRIVE Mini hard drive uses a FAT32 file system, which is compatible with both Macs and PCs. If you need to transfer files over 4GB in size, Hitachi provides instructions on formatting the hard drive to suit either operating system. 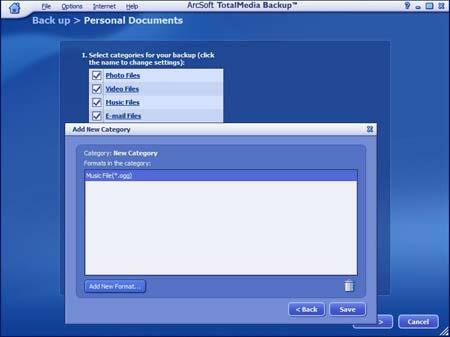 Arcsoft's bundled TotalMedia Backup software is easy to use and has plenty of options. The Mac/PC compatible Hitachi Local Backup software bundled on the SimpleDRIVE Mini is actually Acronis TotalMedia Backup, which is easy to use and provides a comprehensive list of backup and synchronisation options. Backups can be scheduled or initiated based on folders of file types, with presets for regularly used file formats. Unlike the WD SmartWare software that accompanies Western Digital's My Passport SE, advanced users will be able to add their own file formats to be backed up. File transfer performance is average; we don't expect many surprises from a 2.5in hard drive running over a USB 2.0 connection. Optimised drivers like those provided with LaCie's Rikiki external hard drive would be handy but, unless you plan to move huge amounts of data frequently, this isn't really necessary. Though the SimpleDRIVE Mini external hard drive doesn't have any unique features or outstanding performance, its bundled backup suite and low cost per formatted gigabyte make it a worthwhile option.